Advanced Scientologists from around the world attended the Freewinds Maiden Voyage Anniversary, June 11-18 in the Caribbean. The convocation is held each year aboard the Church’s religious retreat—Scientology Motor Vessel Freewinds. Each June, the Church of Scientology celebrates the anniversary of the Freewinds Maiden Voyage. The annual weeklong convocation, attended by Scientologists who have attained the highest spiritual levels in the Church, presents a midyear review of recent successes and charts a future course for expansion. The Scientology Religious Retreat Freewinds casts off from Bridgetown, Barbados for her weeklong Maiden Voyage celebration. Mr. David Miscavige, Chairman of the Board Religious Technology Center, commenced a week of celebration that included an array of events covering Scientology advances, expansion, good news and much more. 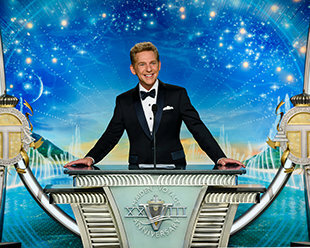 Mr. David Miscavige, led an opening night celebration of the Maiden Voyage that presented a midyear report of monumental Scientology growth. At the Maiden Voyage, Mr. Miscavige highlighted the 28‑year legacy of the Freewinds’ humanitarian mission in the Caribbean. Along with its religious mission, the Freewinds has a humanitarian imperative to bring about a safe environment at every port to which it travels. Consequently, the Freewinds partners with national police and military organizations to deliver programs to nations across the Caribbean as well as Central and South America. The Freewinds has had more than 400 awards, proclamations and recognitions bestowed upon her. The Church of Scientology has experienced 12 months of expansion that out-powers many previous years combined. And, led by Mr. Miscavige, every element of it was on show at the opening night of the Maiden Voyage on June 11. In addition to the Freewinds Maiden Voyage Anniversary evening events, attendees participated in seminars and planning meetings to detail out the establishment of new Ideal Churches in their geographic zones. The Maiden Voyage next featured a night entirely dedicated to the literary legacy of L. Ron Hubbard. Mr. Miscavige commenced an evening in honor of L. Ron Hubbard as a figure at the forefront of 21st century popular fiction. Dan Sherman, Biographer of Scientology Founder L. Ron Hubbard, gave a narrative about LRH’s exploits and accomplishments as one of the leading writers during the Golden Age of Science Fiction in the 1930s and ‘40s—before he authored Dianetics and established Scientology. Mr. Sherman told tales of how L. Ron Hubbard and barely a dozen colleagues created the canon of Science Fiction’s Golden Age. Placing an exclamation point on an evening celebrating L. Ron Hubbard as an author, 22-time Grammy Award Winner Chick Corea performed songs from his albums entitled To the Stars and The Ultimate Adventure both of which are based on seminal LRH fiction works. Mr. Corea further thrilled the crowd with keyboard improvisations inspired by LRH’s epic novel, Battlefield Earth. Yet another evening of the Maiden Voyage celebration was exclusively dedicated to the International Association of Scientologists (IAS) and its role as a movement for humanitarian uplift and social betterment. Mr. Miscavige presented stories of IAS impact spanning every echelon of humanity, from global cities to forgotten lands. The midterm report included the religion’s global campaign action across every category of humanitarian help, courtesy of the IAS. The Citizens Commission on Human Rights (CCHR) Sacramento worked with California officials to secure legislation against systemic drugging in the state’s foster child network. In Kazakhstan, CCHR gained national accreditation to investigate involuntary commitment in the nation’s mental health facilities. CCHR Peru tapped into the root of Electroconvulsive Therapy (ECT) abuse resulting in multiple hospitals banning its use. Youth for Human Rights in Nikolaev, Ukraine, galvanized a network of volunteers that subsequently brought rights education to every school in the city. In partnership with an education network out of Washington, D.C., Youth for Human Rights reached more than 240,000 American kids with a human rights mandate. In the Caribbean’s Dominican Republic, Drug-Free World partnered with national drug counselors to instill better than 170,000 with The Truth About Drugs. Drug-Free World South Africa fought a synthetic drug epidemic in the townships, ultimately bringing The Truth About Drugs to more than 2.5 million people. At San Francisco's Super Bowl 50, Drug-Free World carried out a weeklong anti-drug blitz to rack up over 300,000 people reached with Truth About Drugs booklets in just nine days. In Latvia, volunteers set about and reached ten percent of their population with the common sense guide to living embodied in The Way to Happiness. Gomez Palacio, in Mexico’s Durango state was site of a The Way to Happiness education movement that saw a 12 percent drop in crime. Volunteers spread a message of common sense morality across Amsterdam, distributing thousands of copies and reaching every household in the city. CROWNING THE EVENING in honor of the IAS was the announcement of a landmark legal decision. It was a victory over a blatant act of bigotry, a 670-page Belgium Parliamentary Commission report published in 1997 that stigmatized 189 religions and religious organizations. Driven by sectarian fervor, false charges followed against the Church and its members in what the court described as a deliberate attempt to put a religion, its doctrine or beliefs on trial. Yet, after 18 years, and a 7-week hearing, a 173-page decision dismissed all charges, vindicated all defendants and declared the entire case to be a “serious and irremediable breach of the right to a fair trial”—total triumph for the Church and for religious freedom in Europe. At the end of the weeklong celebration, the Freewinds cast off for another year of passage in her native Caribbean waters, and the next 12 months of ever-advancing growth for the Scientology religion. For the Caribbean, merry send-offs of cruise ships and their seagoing tourists are common. But that ship is not a pleasure craft, nor were the attendees assembled for mere fun, although they certainly enjoyed themselves. While the ship, the Motor Vessel Freewinds, has similarities to a cruise ship—the classic lines, stylish staterooms and first-class cuisine of an ocean liner—it is a religious retreat for the Church of Scientology. For 51 weeks of the year, the Freewinds logs and charts adventures that bring humanitarian and educational programs to the Caribbean and Latin America; and the ship hosts spiritual services for the most advanced Scientologists. That remaining week of the year? It’s special. Very special. Scientologists who have attained the highest spiritual levels of the religion gather in June to look back on the year, celebrate the expansion of the Church, and the successes of massive global humanitarian crusades. Even more important, they coordinate their actions for even greater accomplishments in the coming months. The annual expedition is a convocation of the most advanced Scientologists of the religion. Those attending Maiden Voyage also are part of a dedicated group that has spearheaded the expansion of the religion, particularly through the creation of Ideal Churches in their geographic zone. Nightly major events and briefings of Maiden Voyage covered a diverse and captivating agenda. First on the agenda was the Freewinds itself. This is a ship with a unique humanitarian mission, which was underscored by campaigns in the Caribbean and Latin America throughout the last year. For example, Maiden Voyage attendees learned about Ecuadorian Police Captain Marcelo Montenegro, who vowed to bring Scientology-sponsored programs to his nation, spearheaded by the nation’s police and cadets. Already, there has been a 65-percent drop in general crime and homicides where The Truth About Drugs program and The Way to Happiness, Mr. Hubbard’s common sense moral code, have been applied. Those sentiments echoed through the islands the Freewinds calls home: Antigua, Dominica, St. Martin, St. Kitts, Tortola, Virgin Gorda, St. Lucia, St. Vincent, Barbados, Grenada, Aruba, Bonaire, Curaçao, Freeport and Nassau. Altogether, the Freewinds has won more than 400 awards and honors for aiding her ports of call. “First and foremost, LRH was an author,” said Mr. Miscavige when introducing the enchanting evening’s presentation in honor of Mr. Hubbard’s legacy. Dan Sherman, the biographer of Scientology Founder L. Ron Hubbard, gave a narrative about LRH’s exploits and accomplishments as one of the leading writers during the Golden Age of Science Fiction in the 1930s and ‘40s—before he authored Dianetics and established Scientology. Mr. Sherman presented interviews with luminaries of the literary genre—including a legendary agent, one of the genre’s most acclaimed illustrators and a pioneer of science fiction fandom. That narrative led right through the chronological milestones of Mr. Hubbard’s writing, right up to the very book he wrote to celebrate his golden anniversary as a professional author—Battlefield Earth, a New York Times bestselling novel, now released in a 21st century edition. The Citizens Commission on Human Rights, which during 2016 fought to curb systemic psychiatric abuse in Kazakhstan mental health facilities, within hospitals of Peru and throughout California's foster children’s network. United for Human Rights and Youth for Human Rights, which installed human rights networks in the Ukraine, across Papua New Guinea's Southern Highlands and in Washington, D.C.
Drug-Free World, a group that carried its crusade to turn back the tide of addiction spreading over South Africa's townships, to bring the anti-drug message to Dominican Republic schools, and during a weeklong blitz for San Francisco's Super Bowl 50. Finally, The Way to Happiness, which brought calm and morality as it arrived in Latvia, on the streets of Amsterdam and in the city of Gomez Palacio in Mexico's Durango state. What was undoubtedly a magnificent win for religious freedom became a cause for celebration aboard the Freewinds. Mr. Miscavige crowned the night with the announcement of a landmark legal decision that protects the freedom to practice one’s religion throughout all 47 countries that adhere to the European Convention on Human Rights. It was a victory over a blatant act of bigotry, a 670-page Belgium Parliamentary Commission report published in 1997 that stigmatized 189 religions and religious organizations. Driven by sectarian fervor, false charges followed against the Church and its members in what the court described as a deliberate attempt to put a religion, its doctrine or beliefs on trial. Yet, after 18 years, and a 7-week hearing, a 173-page decision dismissed all charges, vindicated all defendants and declared the entire case to be a “serious and irremediable breach of the right to a fair trial.” The decision was a total triumph for the Church and for religious freedom in Europe. One theme was evident in many ways throughout the weeklong convocation: Church expansion. Between the evening events, Scientologists gathered for planning meetings, in groups representing various continents and geographic zones. The agendas included scoping out new Church buildings for acquisition, reviewing space plans and designs and targeting for construction. On hand were representatives of the Church’s International Landlord Office, the operations headquarters for building projects across the globe. The result has been the opening of 51 Ideal Churches (Ideal Orgs). The most recent opening was in April in Atlanta, and the next are slated in Harlem, NYC, and Budapest, Hungary. Another 50 Ideal Orgs are set to open in the next two years. The finale message of the weeklong convocation was not so much one of “farewell.” But rather, Mr. Miscavige gave a spirited “fare-forward” as passengers disembarked now loaded with ideas for a bold future, and their sights set on horizons and another year of accomplishment.